Supervisors in the field monitoring job quality and progress. Snow management & parking area maintenance is our primary business. We are not a seasonal contractor; we are experts in the field and understand the legal, insurance and local ordinance guidelines. That’s why Confer RBR carries some of the highest limits of snow specific insurance to eliminate or reduce the liability on the part of our clients. This means that our insurance company and legal representation will be there to defend our clients in the rare occasion that a need may arise. Our fully computerized dispatch system allows for the fastest and most accurate response in the event of a storm. We provide a full range of snow removal solutions and contract formats to meet every customer’s need. 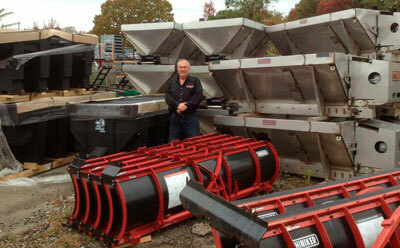 We have a large fleet of snow management equipment to assure equipment is always available during any size event. We are sure that Confer RBR will get the job done. We carry and use a Department of Transportation certified sand/salt, rock salt and liquid brine and small and large machinery to meet even the largest snow management needs. If your offices are not local to the property you need cleared, Confer RBR can provide you with a detailed and certified snow data report upon request. Give us a call or stop by our offices if you have any questions or need additional details. When it snows, go with the pros; because when it comes to snow; we know!! Discover the difference of dedicated and experienced professionals … Confer RBR – Professional Snow Contractors. © 2019 Confer RBR LLC. All Rights Reserved.